May 4th, 2017: Elected by the 44th National Assembly for Deputy Prime Minister for Judicial Reform and Minister of Foreign Affairs of the Republic of Bulgaria in the third government of Prime Minister Boyko Borissov. December 18th, 2015 - January 27th, 2017: Minster of Justice in the second government of Prime Minister Boyko Borissov. March 13th – May 29th, 2013 and August 6th – November 7th, 2014: Deputy Prime Minister and Minister of Regional Development and Public Works in the first and second caretaker government of President Rossen Plevneliev. 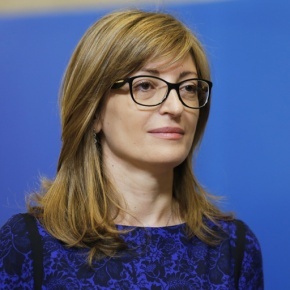 2013 – 2015: Chief of Staff to the President of the Republic of Bulgaria. 2012 – 2013 General Secretary of the Administration of President Rossen Plevneliev. 2009 – 2013: Deputy Minister of Regional Development and Public Works in the first government of Prime Minister Boyko Borissov. 2003 – 2009: Legal Advisor and Director of the Legal Directorate in the Ministry of Environment and Waters. 2001 – 2003: Attorney-at-law practice. Specialized at the National School of Administration (ENA) in Paris, the European Commission for Democracy through Law (the Venice Commission) of the Council of Europe, the Institute of Public Administration in Dublin, Ireland. Master’s Degree in Law from University of Plovdiv "Paisii Hilendarski". Graduated from “Bertholt Brecht” Foreign Language School in Pazardjik, Bulgaria. Married. Fluent in German and English. Awarded Honour Badge of the Union of Bulgarian Jurists. Awarded Commander Cross of the Order of Merit of the Republic of Poland.